Data crunching can underpin more detailed, richer and ultimately more cost-effective risk analysis within the insurance sector. Extreme weather can cause big spikes in claims, and data is the solution to that painful trend. As severe snow warnings and plummeting temperatures hit the UK, the latest World Economic Forum’s Global Risks Report has warned of troubled times ahead for the insurance sector due to environmental risk. Extreme weather events are listed as the top risk measured by likelihood, closely followed by failure of climate change mitigation and adaption, major natural disasters, massive incident of data fraud or data theft, and large-scale cyber-attacks. Extreme weather resilience has certainly become a key focus for the sector. The industry is still reeling from the ‘Beast from the East’ which battered the country early last year and left insurers facing a 290% increase in property claims, along with a £1.25 billion bill in the first quarter of 2018. But, according to this latest report, these types of events are set to become more frequent and severe. Furthermore, all five of the environmental risks that the report tracks are in the high impact/highly likelihood category: biodiversity loss, extreme weather events, failure of climate-change mitigation and adaption, man-made disasters and natural disasters. Environmental and extreme weather conditions are more of a threat in today’s society than cyber related incidents evidencing how crucial it is for insurance providers to be prepared for such events and be in a position to help their customers take risk-mitigating steps. The challenge that many insurance providers face is understanding the true cost that extreme snow, flooding and storms can incur, without having knowledge of prior claims. This would allow them to provide adequate cover for the customer without significant losses if a serious event does occur. Data enrichment and data visualisation tools using perils data, including flood data going back to 1946 are helping the industry to visualise risks right down to the individual property. This is enabling insurance providers to more accurately predict losses from an event like a heavy snow storm, and determine accurate pricing at point of quote and sale. A recent LexisNexis Risk Solutions survey of commercial property insurance providers* found almost all (99%) use some form of location-based data to enrich quotation and underwriting processes, using flood and fire data most often. Some 64% of commercial property insurers also confirmed that their current level of interest in, or need for data enrichment at point of quote is now greater than in the past. Whilst this shows how the industry is evolving in the way it uses data to create a full picture of risk, there is still scope for a greater level of granularity. Our survey found an appetite for using different data types to enrich quotation, underwriting and other business processes. There was also a recognition that a centralised, market-wide contributory commercial claims and policy history database would build an even wider understanding of risk, filling important gaps in knowledge. In the LexisNexis Risk Solutions research, 67% of commercial property insurance providers said they would value such contributory claims data along with shared data related to policy history and property information. However, when asked how likely they would be to contribute to such a database within the next two years, just over half (51%) said they would, with 22% being very likely and 29% being somewhat likely to do so. Understanding risk in commercial property has evolved considerably over the past few years through data and technology enhancements. It is now possible to deliver precise risk scoring for the entire footprint or outline of a building. 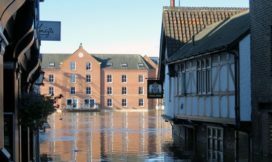 For example, using building footprints as opposed to address location identifies an additional 400,000 properties across the UK that are at potential risk of flooding; an insight that is invaluable to property insurance providers. The key to moving even further forward is to look back. Contributory databases will add a new dimension to understanding property risk, as insurance providers could factor for the risk of a claim based on past policy information related to that property and past claims information. We believe that by increasing awareness of the benefits of contributory databases we can assuage and overcome the current reservations revealed by our survey. The insurance industry needs to continue to adapt and innovate in the face of the increased risks around extreme weather events. Data is already a vital tool in its armoury but there is still valuable data locked within insurers that would bring a much clearer understanding of potential losses. Exchanging this data we believe will lead to greater resilience against extreme weather losses. *LexisNexis Risk Solutions commissioned a survey of UK insurance professionals with responsibilities related to commercial motor insurance underwriting or pricing, in the case of a first group, and commercial property insurance underwriting or pricing in a second group. 77 interviews were conducted for each of these surveys, via telephone and online. LexisNexis Risk Solutions was not identified as the sponsor of this research, which was completed during November and December 2017.